Caddis Systems is a company that specialised fully on wading equipment. I already tested other products made by them and the quality is usually average. Let’s see what their felt sole wading shoes provide for under 50$. 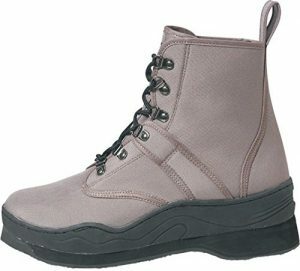 When you look for wading boots, the two most popular choices are felt soles and rubber soles. Both come with advantages and disadvantages that you should know about before making your purchase. Rubber is a good choice if you walk a lot during fishing, for example, while switching spots. The soles will withstand abrasion and behave mostly like the soles of classic hiking boots. If you get a decent pair here, even long hikes won’t be a problem, at least not because of your shoes… The grip in rivers, while being mediocre in the past, is quite good today, thanks to technology. A remarkable example of this type are the Redington Skagits. All that said, felt soles– as used in the Caddis– will give you superior traction. While some rubber soles come close, felt is still the number one in terms of grip. As soon as the fabric gets wet, it becomes soft and adapts perfectly to the underground. The downside is, that felt wears down fairly quickly when you walk a lot with them and while you can replace it, you should evaluate what fits your needs better. Another problem can be the fact that they are actually banned in a few states in the United States. In short, the reason for that is that felt soles take longer to dry, making it easier for invasive species to survive in them compared to rubber. When you switch rivers now there is a chance that you act as a courier for said species and they start to breed at the new location. A quick google search will reveal if you state is affected. The upper outer of the Caddis is made from polyester, this supposed to give them a good drainage system allowing the entered water to leave the boots quickly as soon as you leave they leave the river. This important so your legs do not get unnecessarily tired. Since the polyester itself is not durable enough to withstand the constant contact with stones or similar the lower area of the boots is reinforced with rubber. This improves the longevity drastically and is the standard structure. This also prevents hitting your toes on stones which can definetly be painful. They come with cushioned insoles supposedly to make them a bit more comfortable, if it works, I will tell you further down. The quality of the seam could be a little better. I found the threading to be slightly loose in some areas, but nothing to worry about. All Caddis boots are oversized around half a size. They already plan in, that you will use them with stockingfoot waders and you need room to fit your neoprene booties inside your shoes. However, for me, they still were slightly too big hence that I laid in another inner sole I already had at home. Alternatively, you could also wear another pair of thicker socks. Nearly every wading shoe performs well on gravel or sandy ground. That in mind I drove to a stream mostly filled with bigger slippery rocks to give them a challenge. I tested them together with the Caddis breathable chest waders, which they are apparently designed for. The felt soles had enough traction to maneuver through the stream while feeling secure. What I did not like though is the amount of ankle support the Caddis give you. I am used to more and this is certainly not enough to prevent sprains or worse if you take a wrong step. Keep in mind that when you wear them for the first time, don’t rush anything and get used to them slowly. I saw people slip in fast rivers and trust me, that is not something you want to experience. I recommend leaving your rod back at first and take a stick instead, which you can use to give you extra hold when needed. 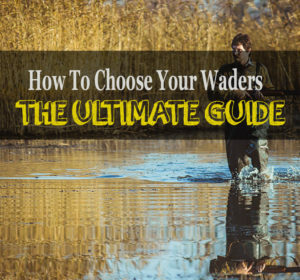 You do not have to buy a special wading stick for that. Once you know how to move in the water you can start fishing without worries. Once you leave the river the water inside your boots drains out slowly. I saw better drainage systems before, but it still works and prevents them from staying heavy when you switch fishing spots. When you look for wading boots under 50$ the Caddis felt sole wading boots are not the worst choice. All the basics, that you would need are provided except sufficient ankle support, which is definetly a downside especially for beginners that are not used to walk in rivers. If you can not connive that you should have look at my Redington Palix review.